Detox juices are the best for purifying the organism and freeing it from toxins. Here are some simple recipes very effective for detoxifying the organism and feeling fit. 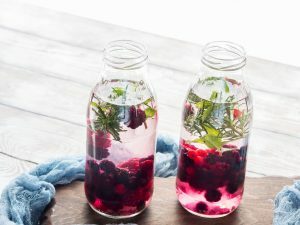 Detox juices are natural drinks useful to purify our organism in an effective and fast way; they can be useful for those who want to lose weight but also for those who decide to follow a detox diet to get rid of toxins and enrich their diet with the so-called green juices rich in vitamins and minerals. Let's see how to prepare these juices that calm down also hunger, purifying and draining juices that are very easy to prepare; a way to purify the body after Christmas, summer holidays or all those periods when you feel the need to regenerate, following a unhealthy feeding period. Detox juices are the best for purifying our organism and not only; in fact, when we squeeze the peel we keep all the vitamins, nutrients that often lack in our diet and that can help us regain energy and vitality. 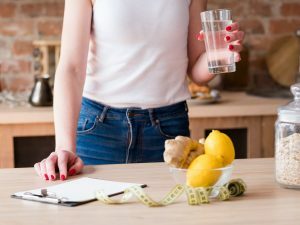 The best is to try to start for two or three days to begin to feel the first benefits and also their satiating effect that will be useful for losing weight. 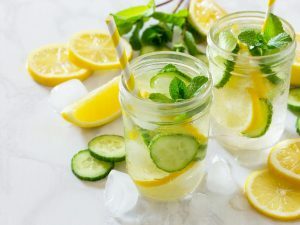 To enhance the effect, detox juices should be consumed as soon as prepared so that fruits and vegetables keep their properties intact, also it is advisable to drink them on an empty stomach. Detox juices will help you eliminate toxins, deflate the belly and also improve the appearance of skin and hair that will be healthier and brighter. Which food have you to use to prepare them? To prepare detox juices you need the right foods, those detoxifying and purifying foods that will make them really effective. You can make different combinations, just fruit and spices, fruits and vegetables or just vegetables. 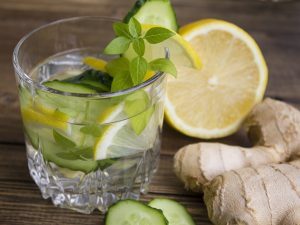 Among the foods that are often present in detox juices you can find apple, celery, ginger, lemon, and green leafy vegetables such as spinach, cabbage and broccoli. Here is a series of simple recipes to prepare purifying juices that are also very tasty and nutritious to drink in the morning or as a snack. 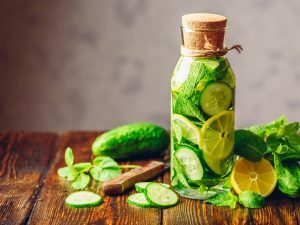 This juice has detoxifying and draining properties and you can prepare it with 1 green apple, 1 cucumber, 2 stalks of celery, 2 sprigs of rosemary, a sprinkling of ginger and turmeric, and you can also add a teaspoon of lemon juice. 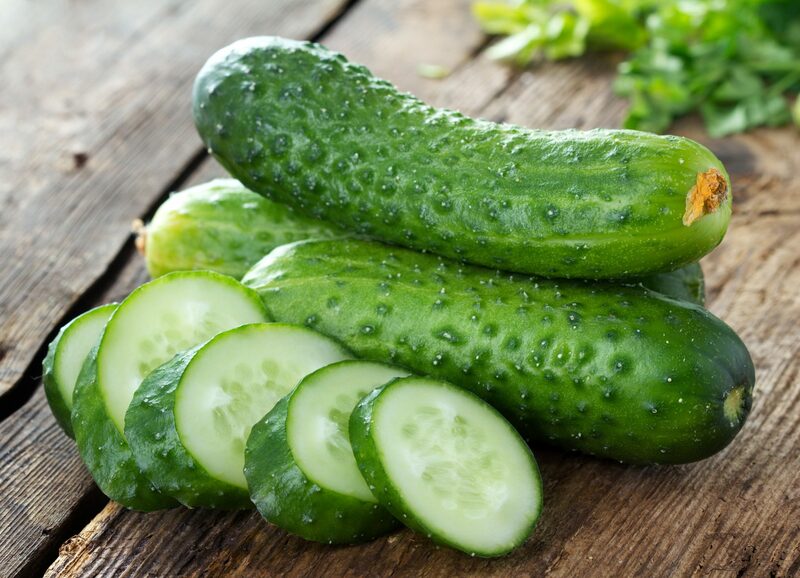 You will free your organism from toxins thanks to the purifying properties of celery and cucumber. On the other hand, ginger is excellent thanks to its digestive and anti-inflammatory properties, and it also helps to reduce the sense of hunger. Turmeric gives to this juice detoxifying and antioxidants properties. An excellent ingredient to prepare a juice that provides also an antioxidant action is the beetroot, a vegetable rich in anthocyanins useful to fight free radicals, as well as in vitamins and minerals. It must be added to the parsley that is useful to oxygenate the blood. To make it, you will need 1 peeled beetroot, 1 bunch of parsley without stem, 1 carrot and 1 stalk of celery. A quick recipe for an excellent juice, also thanks to the fiber content, that increases the sense of satiety. 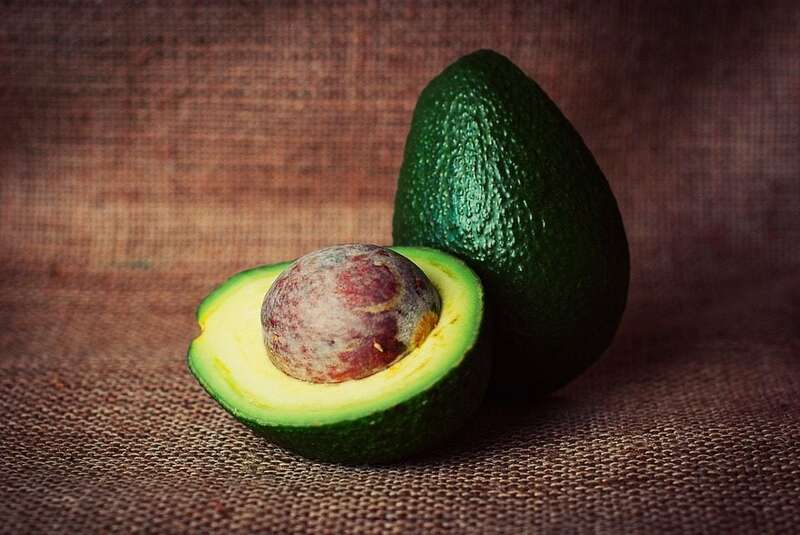 Among the detoxifying and dietary foods we find avocado, that is also useful to lower levels of bad cholesterol in the blood, thus helping to prevent heart disease. Moreover, it is a fruit rich in Omega 3, the famous "good fats" useful for heart and brain health. To prepare this juice you will need 3 tablespoons of avocado pulp, 100 grams of spinach, the juice of a lemon and a pinch of salt. 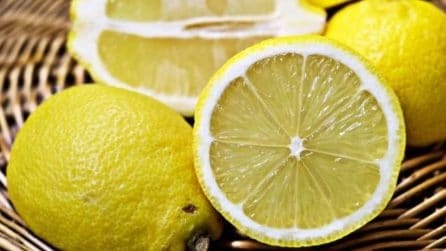 Lemon stimulates diuresis and it also helps purify the organism while spinach is rich in minerals such as calcium, phosphorus, iron and copper. Drink this juice for at least 4 days in a row to make the most of its benefits. The papaya and lemon juice provides a detoxifying action and it also promotes digestion. Both the fermented papaya and the fresh papaya are rich in antioxidant and digestive properties, they also reinforce the immune defense system and help fight tiredness. Preparing the juice, remove the seeds that can have an unpleasant bitter taste. To prepare it, you will need papaya pulp, 1/2 lemon and 1/2 ripe mango. You will prepare a digestive and purifying juice. 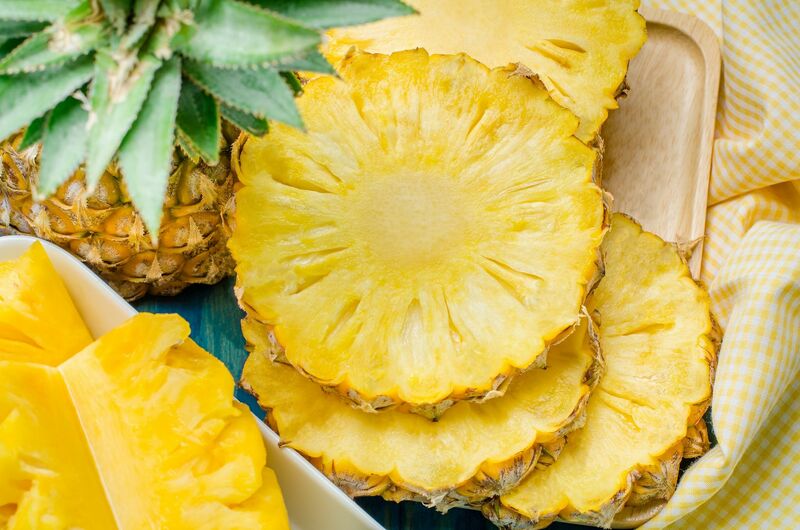 Preparing a pineapple and ginger juice will also help you to eliminate the swelling, in addition to purify the organism and improve digestion. For the preparation use only fresh pineapple, avoiding the canned one that contain too many sugars. To prepare it, you will need 3 slices of pineapple, 1 lemon, 2 kiwis, a teaspoon of ginger, a pinch of turmeric and 1 glass of water. The kiwi will provide vitamins and nutrients useful to our organism, and it also helps regulate blood pressure and heartbeat, as well as being an excellent natural diuretic. Among the purifying foods par excellence we find fennel (vegetable and seeds). To prepare it, you will need 50 grams of fennel pulp, 10 grams of fennel seeds, 2 sticks of celery, 100 grams of apple, 4 tablespoons of aloe vera, half a lemon, 2 or 3 pieces of ginger. Before preparing it, let the fennel and seeds soak in water for 30 minutes, so as to make them softer. The addition of aloe vera gives this juice a powerful purifying effect for the liver and intestine, thus helping to clean the organism from waste and toxins.